This whole outfit, (minus the shoes) is from Urban Outfitters. I havent been in one in a while, and forgot how much I love the place! Really cool and casual. This is something I'd wear everyday. love this grey shaded colorconbo! 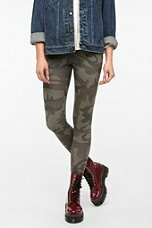 Those leggings are a perfect dip into the cammo trend...very subtle! Please so not fall into that pool below you...ok! !